Of course, Hallowe’en belonged to Big Al. It grew dark by five today. The last streaks of the pale grey light slipped away, leaving a wet town with an air of expectation. Not every house was decorated: but our estate had its share of houses festooned with elaborate stage-cobwebs and severed limbs. I don’t know when wraiths gave way to horror stories as tale of choice, but somehow the poetry has slipped away, though the pumpkins still grin through the rain. But the poetry burst in this evening, through the door, dressed in a diminutive black bat outfit and mask. It was boisterous poetry: you know, the kind written by Roger McGough or Michael Rosen. But it was poetry, nevertheless. It charged past me, up the hall, and hung an enthusiastic left in the direction of the party food. “Auntie Kate, let’s sing a Hallowe’en song!” the bat cried joyfully. We paused. I think it must have occurred to us both at roughly the same time that there were not many of those about. It did not seem to bother Al. He is great at diversifying. And at that moment, a skeleton walked in, which caused a dog’s leg bend in the conversation anyway. “Hello Felix, I’m Flappy the Bat!” Al bellowed joyfully. Al’s mother entered, brandishing snacks for the bat. The skeleton eyed the bowl of onion rings wolfishly. I decided that it must surely be time to sit down for tea. And in they came: the zombie Victorian maid – how much longer will my daughter dress up at Hallowe’en? – and the diminutive witch. The corpse bride, the final princess, had repaired to her friend’s for a sleepover. We were depleted, yes, but you would never have known it. Al was bellowing for five. Never have the undead devoured cocktail sausages with such devastating speed and efficiency, or iced doughnuts with more panache. The tea disappeared quicker than you could say Nosfiratu, and we prepared for our trick or treating. We have a sedate programme: we visit one house, that of Granny Norma, my husband’s mother. We telephone ahead to advise her there will be a knock on the door: and pop in for a cup of tea before she bestows Haribos on the assembled ghouls. Accordingly we set out into a rather damp world in which various small wraiths, corpses and vampires drifted, always accompanied by an adult, from door to door, collecting sweets in buckets, drawn by the grinning pumpkins to sympathetic householders. Each encounter was a delight for Al, who would strike up conversations with anyone. It appears he had already invited a lady at the costume shop to our party. The more the merrier, as far as this bat was concerned. “Felix, will you play with me?” he enquired of the skeleton, who had been charged with the superhuman task of holding Al’s hand through the murky forest to Granny’s. Felix mumbled something non committal. Al’s sister seemed reluctant to play, too. “I’ll play, Al,” I said. Right-ho, then. Flappy clearly wanted some me-time. We visited Granny; the sweets found the way to each ghostly apparition’s pocket and we stepped back out to find it was pelting with rain. But Flappy the Bat didn’t give two sonic squeaks. He dodged the raindrops, a bat living in the moment, ecstatic, surrounded by all the ghouls he loved most in the world. Personification of the poetry of Hallowe’en. Posted in Big AlTagged Big Al, children, family, Hallowe'en, humor, humour, trick or treatBookmark the permalink. Priceless. No wonder Halloween’s such an occasion at your place with that kind of language. They had some close up photography of English bats on TV last night which showed them in a very loveable light. As soon as I saw your post title as a Big Al story, I started smiling. It would be so much fun if we could all go back and be 4 or 5 years old and enjoy a Halloween night of Trick or Treating, especially with a favorite Auntie. I must be sure to treasure these times as much as I can, Lou: I know they will pass, though they seem eternal. Ah, most useful, thank you, Andra. I can start mugging up ready for next year! Gorgeous, and long my he remain in that delightful world of his. Flappy as Poetry… I very much enjoyed this entire post. Dear Kate, this posting was poetry in motion–Al’s flapping! Peace. Thank you, Dee. Peace to you too! Relieved you didn’t get hit too hard, Carrie: I have blogging friends in New York and life has changed considerably for them. Enjoy your Friday Hallowe’en! But of course he was named Flappy. What else would you name a bat? Oh, how I miss those Halloween nights of yore – more the gratitude now for a poetic bat, a skeleton, diminutive witch and zombie maid! I love the way you all set down for tea. Loved your post this day, Kate. Thanks, Penny, Tea time comes round as certainly as the setting sun. Hi Annie! Thanks for reading and leaving a comment. So pleased you enjoyed it! 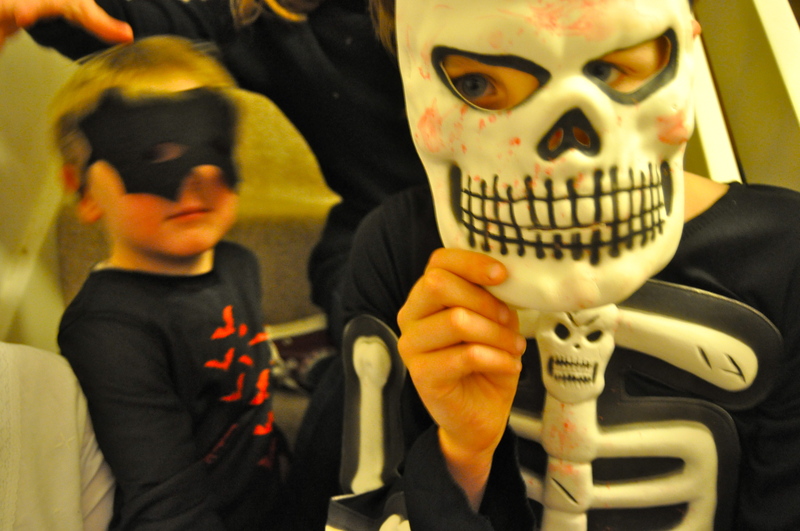 Wonderful Hallowe’en romp, Kate. Teatime at Aunt Kate’s . . . and a cup of tea at Granny’s to collect some candy. A fabulous Halloween tea, Kate! Sounds like you all had a howling good time! Does Big Al know he has a universal following? People without such wildlife are SO boring! I love the choices in costumes. All are so ghoulish and go well with the themes you’ve presented this week! 🙂 Dear Al…I am sure going to miss his little boy ways when he decides to leave them behind. I hope it isn’t too soon, but because he is the same age as Sophia I can imagine certain things that go with this stage of development. Delightful story! Beautiful story. Big Al’s appreciation for Halloween matches my own. I remember feasting on the contents in my goodie bags long thru the night. The night’s been given over to severed limbs and Scream costumes. But, I prefer the little bats, ghosts, princesses, and cartoon characters. Me too, Judy. They are much preferable, and they allow our children to stay young a little younger.